A harrowing experience is highly distressing, terrifying, or very disturbing. When you incense another person, you make her angry or very irritated with you. When you are indignant over something you are angry or really annoyed about it. When you infuriate another person you make him extremely angry or very mad with you. An insurrection is a rebellion or open uprising against an established form of government. A neurotic person is too anxious or worried about events in everyday life. When you are unflappable you remain calm, cool, and collected in even the most trying of situations. After the car accident, the police officer behaved with calmness or steady equanimity toward everyone. Despite the small injuries as well as the anger and aggression of those in the accident, the officer answered all questions with equanimity and did not get upset by the situation. Rather than show a display of temper himself in this moment of stress, he handled the entire situation with equanimity and coolness, which helped the victims remain remarkably peaceful themselves. Quiz: Try again! What is equanimity? A gift for bringing people together after conflict. A role of someone in authority in an emergency. Cool confidence of mind despite a difficult situation. Equine Imitation Whenever Angus got angry like a bull he would calm himself by imitating a peaceful equine, exhibiting equanimity. Equanimity is the “state of equal mind,” that is, one’s mind does not become agitated but rather stays even and peaceful. 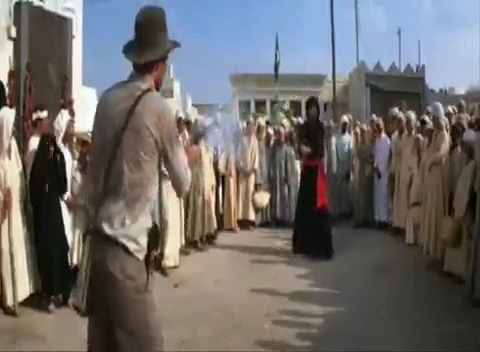 Raiders of the Lost Ark Indie shows equanimity in the face of a skilled swordsman.